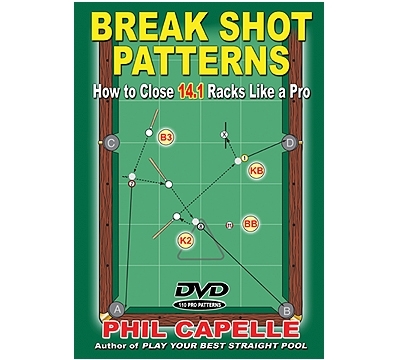 Phil Capelle’s new book & DVD combo will teach you to master end-of-rack position and pattern play in straight pool. This spiral bound book includes 288 big pages of insight and instruction; a 40 page introduction that teaches you the principles of planning patterns; 110 four-shot run outs; and 380 illustrations. The all-star lineup of players on the 2-hour DVD includes Sigel, Rempe, Souquet, Hohmann, Mizerak, Schmidt, Archer, West, Robles, Reyes, Immonen, and many more.